Zigity, Conga, Balloon Lagoon & Hullabaloo (by Cranium) are Hot Toys thoroughly reviewed. 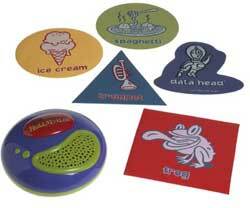 Nationally recognized, Cranium games have won more than 50 industry awards. Cranium, Cranium Cadoo, and Cranium Hullabaloo are all recipients of the prestigious Toy Industry Association U.S. Game of the Year award, with Hullabaloo winning most recently at the 2004 American International Toy Fair. Sculpt, act, guesstimate, and pick hilarious words to win! Cranium Conga is the fast-paced guessing game that will get your whole family acting, sculpting, guesstimating, and picking hilarious words. How many times has grandma climbed a tree? Who knew Uncle Gus's dream job is to be a ferryboat captain? Can your sister-in-law really make 50 different animal noises? Everyone ages 8 to adult will have a great time laughing about the fun facts that only your family and friends would know. You might sculpt something that's under your bed, act out a place you'd like to visit, or get people to guess what you wish your nickname could be. 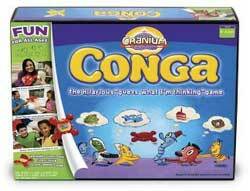 Write your answer on the erasable secret pad inside the Conga timer, close the cover, and pass it to the first guesser. Everyone takes turns racing to guess the answer before the timer goes off in their hands! It's all the fun of a day at the carnival! Four fast-paced activities keep kids (and adults) challenged and amused as they race to collect balloons, flip the frogs in the pond, spin the wheels to match the picture, fish for letters in the lake, match the treats as they spill out of the snack shack, and do it all before the musical Merry-Go-Round timer stops. It's the perfect combination of skill, chance and thinking. 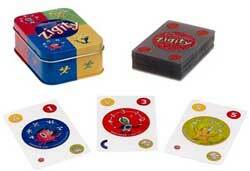 A lively game that's fun and develops sequencing, dexterity, matching, and simple spelling skills. 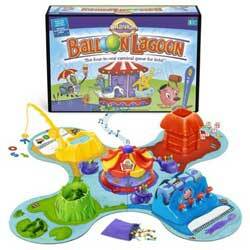 The game of tunes, twists, and topsy-turvy fun. Hullabaloo is the high-energy game that's full of cool tunes, fun sounds, and all kinds of surprises. Kids listen closely and think fast as they bounce, twist, spin, high-five, and dance to the music, sounds, and friendly voice of Hullabaloo. Whether after school, at a birthday party, or even on a rainy day, Cranium Hullabaloo gives kids something to cheer about. And with thousands of game variations, kids never get tired of the fun. Hullabaloo won the 2003 Toy Industry Association Game of the Year award, which recognizes the most innovative, interactive, and playful game of the year.